How do I come to my understanding of the benefits of chickens being in the backyard? Some people may not comprehend the idea of “cleaner environment” when they think of the possibility of their neighbor getting chickens and having to deal with the smell. Well, here’s the thing, if you are going to have chickens you do need to be a responsible owner of chickens and clean the coop, as the issue of animal cruelty comes into play. Walking next to my neighbor’s chicken coop and enclosure I couldn’t smell any bad odor. But what I meant by cleaner environment had to do more with the fact that my family collects fruit and vegetable trimmings (like watermelon and melon rinds) from time to time and drop them off to the neighbor to feed her chickens. That way they don’t go in the landfill. I currently don’t have the ability to create my own compost pile, so I hand the fruit and vegetable left overs to the neighbor when I can. My grandmothers both had chickens in Greece, and I remember as a child how little waste there was when preparing and finishing meals. Even stuff like leftover spaghetti with tomato sauce was given to the chickens. Very little went into the garbage – all encouraged by chickens. You truly are getting a healthier egg when you raise your own chickens, predominantly because you control what you feed them and once the eggs are laid, you have the ability to eat them or cook with them immediately. Store bought eggs come from chickens that have been fed grain, corn and sometimes grass, instead of acquiring more vitamins from being fed a variety of fruit and vegetable trimmings. The flavor in these types of eggs are so much richer and flavorful. My best memories of eating fresh eggs are those from my grandmothers in Greece that ate everything. How are chickens in the neighborhood educational? If you have children, take this as an opportunity to teach your children where their food comes from and the importance of healthy eating. My two-year-old daughter eats eggs and has learned about chickens through books and has even seen them in a cage at a zoo, but until we met our neighbors she never touched one and wasn’t able to relate where eggs came from until she saw the neighbor’s chicken coop. 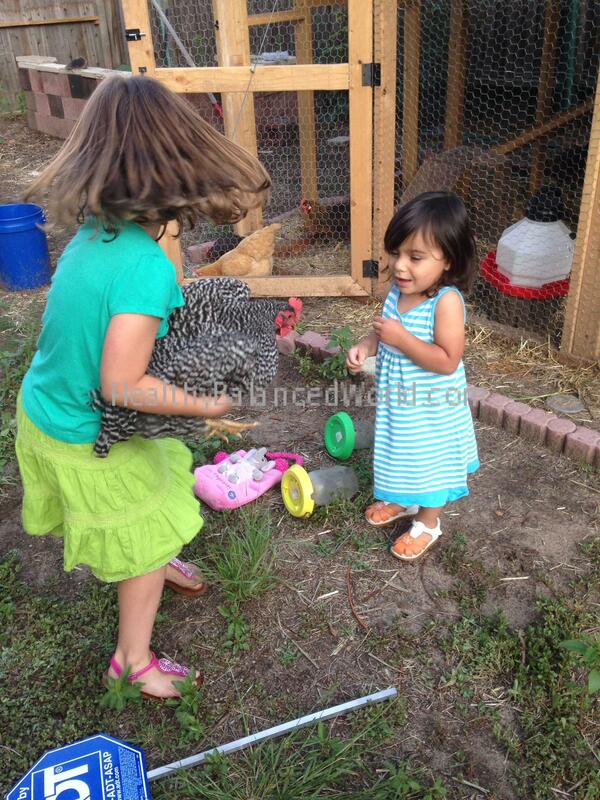 These were the first chickens she was physically able to pet and now she is fascinated and eager to learn more. If you don’t have children take the time to ask your neighbor questions instead of jumping to conclusions about what it means to have chickens in your neighborhood. This is not only educational, but encourages community interaction. We live in such a fast paced society today that so many of us don’t know who are neighbors are, and this is a great talking piece to get to know your neighbors better, and learn something new at the same time. The benefit to me and my family is that we were given the privilege of getting to know a really nice family across the street, and handed a dozen fresh eggs from our neighbor for free, preventing our need to purchase eggs for one week. Plus my daughter had a very positive experience learning about chickens and eggs, and even asks for her morning egg more often now. Raising chickens in your backyard may not be for everyone, but if one of your neighbors has a few, don’t panic, think of all the benefits you and your family can learn from it, as well taking the time to bond as a community. Who knew a chicken could be a source of balance to a community?